Lisa: I started playing last year, in 2018. I teach with Jessica Oya, and volunteered to help her run the cross country team. She would make me run with her, and tell me about this crazy sport where she was always injured and bruised but got to know and play with the best women. Every run she asked me to join, and every run I told her I’d never do that because I’d never played a contact sport. As the cross country season wound down, she said, “How’re you going to keep this fitness up?” And I agreed to go to one practice. Now...here I am. And loving it. Lisa: Tennis and running, the least contact sports ever. Lisa: To learn all that I can so that I can be less confused with every game I play. The beginner mindset is more than an attitude for me - it’s a way of life! Lisa: Jessica Oya, see above. How long have you played for us? Lisa: Since December 2017. I’ve played 7s, practiced with WPL and am in my second D2 season, though! What is one of your best memories thus far as an All Blue? What do you like most about being on this team? Lisa: I just love the amazing people on this team. I’m in awe of all of them, and beginning to wonder why I ever hang out with anyone else. JUST KIDDING don’t tell my other friends that. Is there a particular player and/or coach that has influenced your development as a player? Lisa: Evan Hoese, Chou and Bosko are the best coaches! I love Bosko’s wisdom (I’ll be publishing a book on her wise sayings soon, no one steal my idea), Chou’s sassiness and support, and Evan’s self-prescribed loving Dad approach of whipping us into shape, with love. Every All Blue I’ve played with so far has influenced me greatly, and I have too many role models to name. I wanna be all of you when I grow up, seriously. Lisa: “This sport is super confusing, just keeping playing it until it’s less confusing.” I honestly think every teammate so far has told me that. And they’re not wrong! Lisa: All of them. I’m so new and green. As a teacher, how do you balance work and playing rugby? 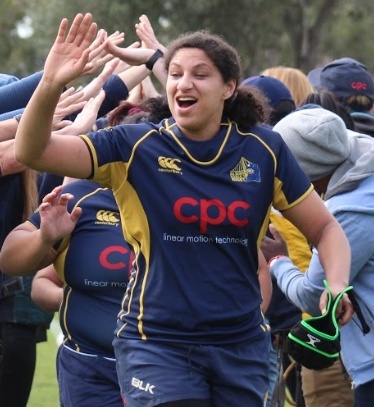 Lisa: One of the ways I do this is by inviting my students into the world of rugby, but inviting them to games and letting them know when I have practice and games coming up. It’s fun to know that 6th graders in East Oakland are getting a small bit of exposure to this sport through me, and we can bond over their love and dedication to the sports they play to the sport I’m playing. Plus, now I can relate to the soccer playing students wearing cleats! Who’s your favorite rugby player/team to watch? Why? Lisa: The All Blues. Because duh. Lisa: Something classic and reliable, like French Vanilla or Chocolate Chip cookie dough. Lisa: Declaring that I wasn’t of this rugby culture the first time I had to chug a 40 in front of everyone. I’m still really bad at chugging. It takes more than 3 people to bring Lisa down! When and how did you first start playing rugby? Bean: I started playing rugby at Cal in Spring 2016. I had never touched a rugby ball before, walked on and immediately fell in love with the sport/culture, and the team welcomed me with open arms. Bean: Pray before I play. And Beastmode. Bean:Going to New York for 7s Nationals last summer. I love the camaraderie of this team, my whole family is in San Diego, but the All Blues are my family here. Bean: Player / coach Evan Hoese has taught me a lot since I joined the D2 team last year, influencing my drive for rugby. Irene Gardner has also shown me so much wisdom and been a big influence on my development and my love for the 7’s game. How do you balance work and playing rugby? Bean: As a mental health counselor for traumatized kids, I have to balance maintaining the energy to keep up with this full-time job that’s emotionally and physically exhausting. Playing rugby is a huge part of my self-care and helps in refreshing my energy day to day. Bean: Watch out, I’m an identical twin. 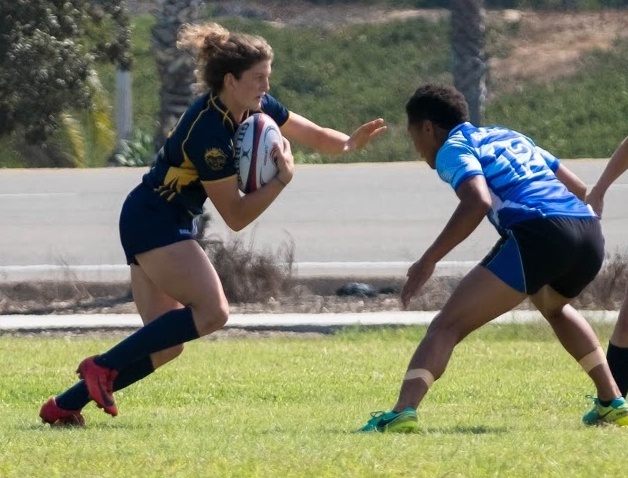 The Berkeley All Blues Women’s Rugby Club is currently seeking a Head Coach for our Women’s Premier League (WPL) season beginning August through WPL Nationals in mid-November 2019. The ideal candidate is committed to working with elite, senior-level female athletes to build and maintain a championship-level team. Jaz: I started rugby in 11th grade because I did cheer all my life and wanted to prove that cheerleading is a sport and that I’m an athlete. Jaz: My grandma was my #1 rugby supporter so I just think about making her proud every time I touch the pitch. Jaz: I searched WPL teams and found that the All Blues practiced not too far from my company’s California site. Jaz: My first away game in Denver because it was surreal watching WPL players in action in a huge stadium. I couldn’t believe I was a part of such a high level team. My favorite thing about this team is how helpful everyone is at practice and the mix of backgrounds. I have current and former Eagles helping me improve my skills… I couldn’t ask for anything else! Jaz: Evan Hoese. She’s the first person I met on the team and the person I kept in contact with during my move to California. Aside from just being helpful, she inspires me to dominate on the field because when she steps on the pitch everyone knows it. How do you balance life, work, and playing rugby? Jaz: I’m a full time senior surgical technician in research, part time veterinary assistant and I’m finishing an online MBA in healthcare administration. I balance it by talking to my cat, Bucket. He tells me to take a break and destress by playing with him and I do it and it works! Jaz: Naya Tapper. She’s unstoppable and such a strong player every game. Jaz: I’m just happy to be an All Blue!